This gorgeous looking Red Grasshawk dragonfly flew in and perched on the leaf tip of Sansevieria trifasciata ‘Golden Hahnii’ whilst I was happily snapping the colorful mounds of Ruellia Brittoniana ‘Katie’ that grow beside it in our flower bed. What a marvelous surprise! 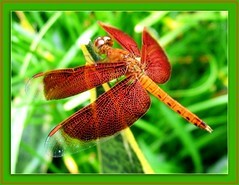 This male Red Grasshawk dragonfly is an absolute beauty, no doubt about that! More amazing when viewed through the camera lens and on my computer! Such incredible patterns and lines on its reddish earth-toned wings with transparent wing-tip that has a dash of orange-red band too! 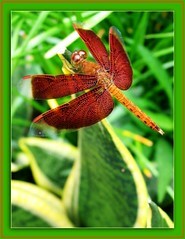 So beautiful, even though it is a very common dragonfly in our tropical country, Malaysia! The female species isn’t this colorful, though. Habitat: Lakes, drains and marshes, forest fringes and secondary vegetation. Distribution in Asia: China, Indonesia, India, Laos, Myanmar, Malaysia, Philippines, Singapore and Thailand. Lest I forget, Odonata is an order of insects, encompassing Anisoptera (dragonflies) and Zygoptera (damselflies). Click to enjoy an impressively large gallery of Odonata photographs from the University of Michigan!